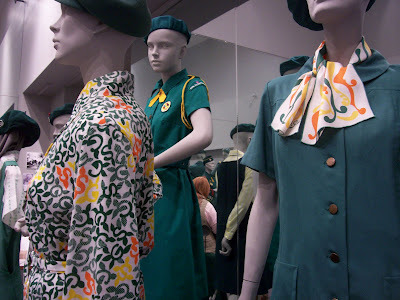 Betsy Butler of beesfirstappearance reports that her interest in the Girl Scouts is at an all-time high after attending an exhibition of Girl Scout uniforms and memorabilia at The Ohio State University Historic Costume and Textile Museum. Organized by the Girl Scouts of Ohio’s Heartland Council, which serves girls and adult volunteers in 30 Ohio counties, the exhibition commemorates the 100th anniversary of the founding of the Girl Scouts. Historic uniforms, pins, patches, badges, handbooks, dolls, and other keepsakes from the council’s archive committee collection are on display. "Uniforms are an important way to make people feel like they belong to an organization and to demonstrate their pride in being a part of it," reports Butler. "Throughout its history, the Girl Scouts have taken this endeavor very seriously. You might not think that you can make a fashion statement with a uniform, but this exhibit shows just that. The Girl Scouts partnered with fashion industry leaders to design and create their uniforms, the Historic Costume and Textile Museum’s Gayle Strege and Marlise Schoeny wrote in the exhibition’s text panels." The exhibit, entitled “Historic Girl Scouts Uniform and Memorabilia Exhibit,” is at The Ohio State University Historic Costume and Textiles Museum (Gladys Keller Snowden Gallery) at 175 Campbell Hall. Running from March 10 through June 1, the display includes mannequins wearing Girl Scout uniforms from the early 1900s to present, as well as collections of Girl Scout camping equipment, books, accessories, dolls and toys, patterns, jewelry, magazines and other printed materials, photos, badges and patches, and many other gems from our council’s Historic Preservation Committee collection. Several of the uniforms were designed by famous designers, including Mainbocher, Halston, Stella Sloat, and Bill Blass. In addition to the one-time-only display of gems from our archives, we are working with OSU faculty to provide programs to Girl Scouts. The council held girl programs on March 10, and offer another on May 19, on these topics: "Strong Body Image & Self-Esteem" and "Careers in Textiles and Fashion." These are being taught by OSU faculty Nancy Rudd, PhD, and Gayle Strege, OSU museum curator.